I am starting this a bit late, but am excited to share my experience. I am going to post comments with photos in chronological order to catch up! 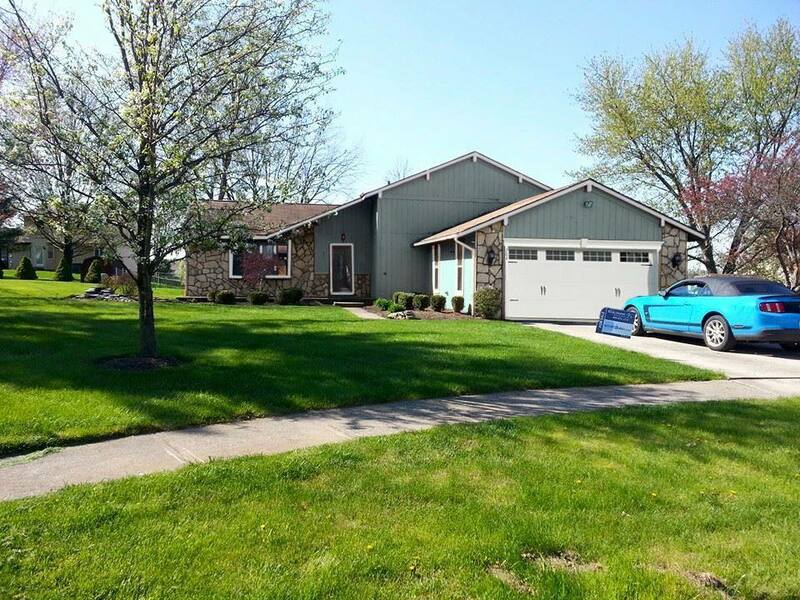 I found this foreclosure home in Pickerington, Ohio on Hubzu.com. It was Spring 2015. 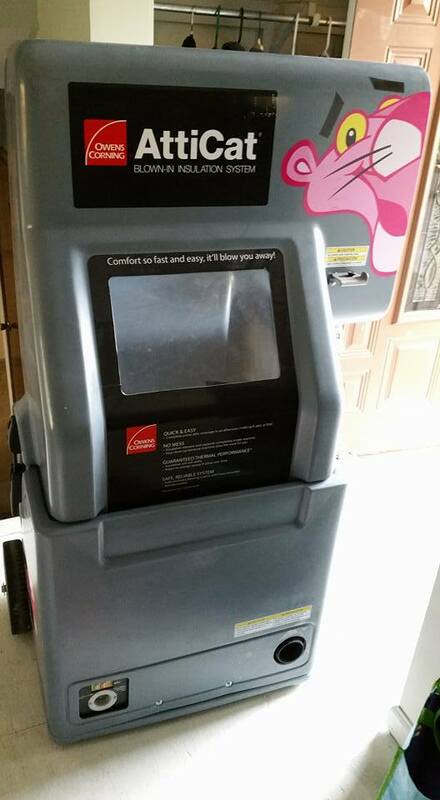 It was listed as an online auction with a low starting price. 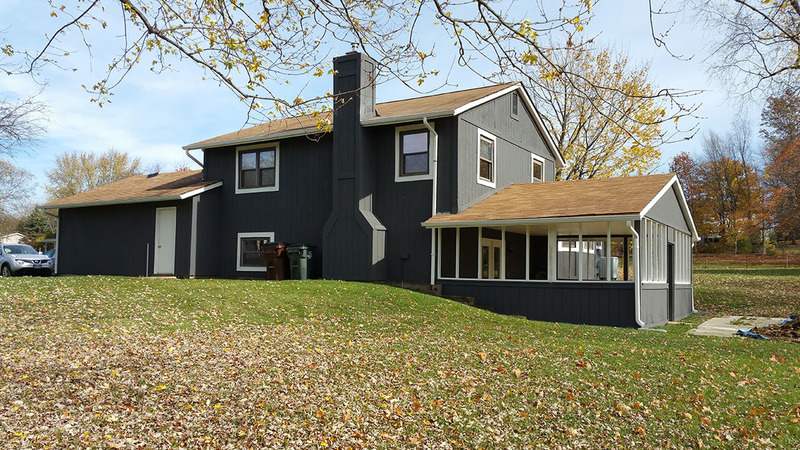 1,320 sqft split level (4 levels). 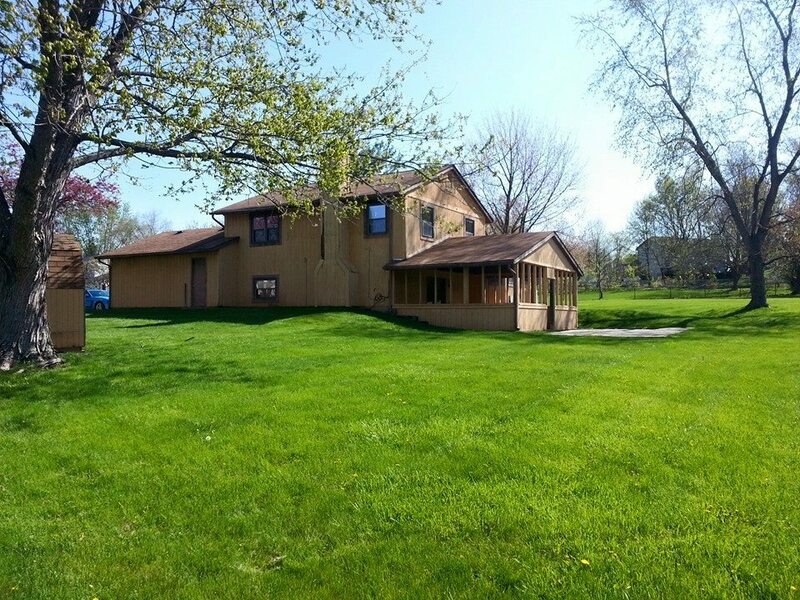 4 bedrooms, 3 baths, formal living room, family room, unfinished basement, 2 car garage, and a fireplace. It had sat vacant for a year. 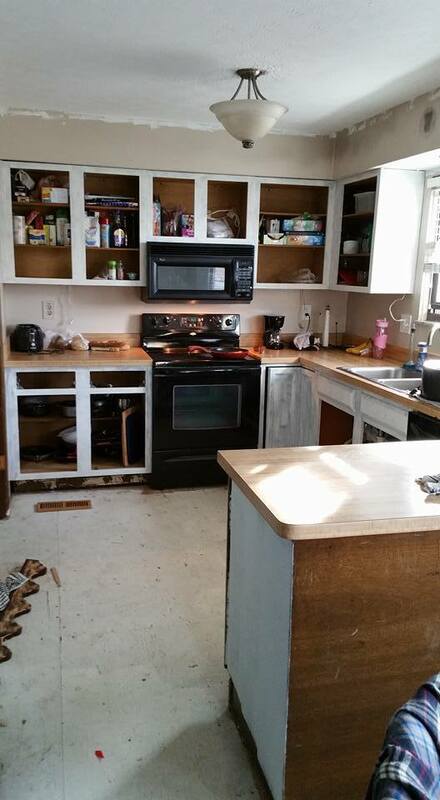 I checked it out with my realtor and knew immediately that it had that cheap "ugly duckling" potential. Ugly house in a very nice neighborhood on the edge of the city. It sat at the end of a large quiet cul-de-sac. 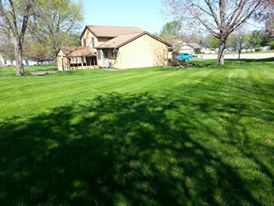 Good sized yard and well kept houses in the neighborhood. Even the landscaping was quite nice. 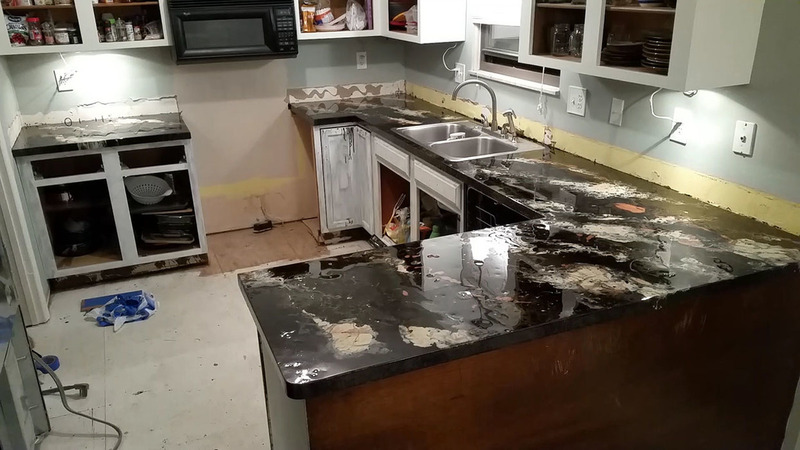 My only real concern was that there were some foundation, wet basement, and mold issues. That is enough to scare most people away. 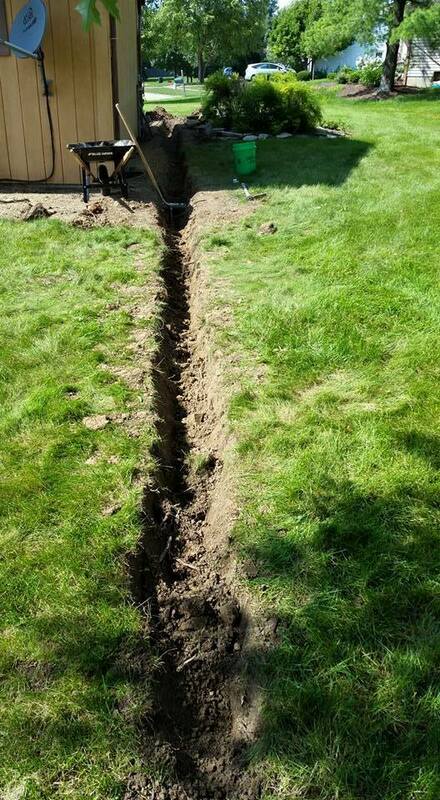 I had a structural engineer come out and tell me how bad he thought the foundation was. 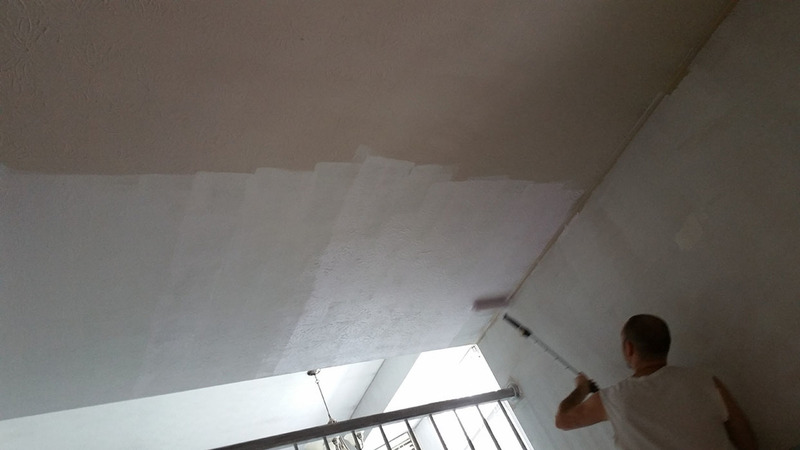 We had some inward movement of the walls due to hydrostatic pressure. 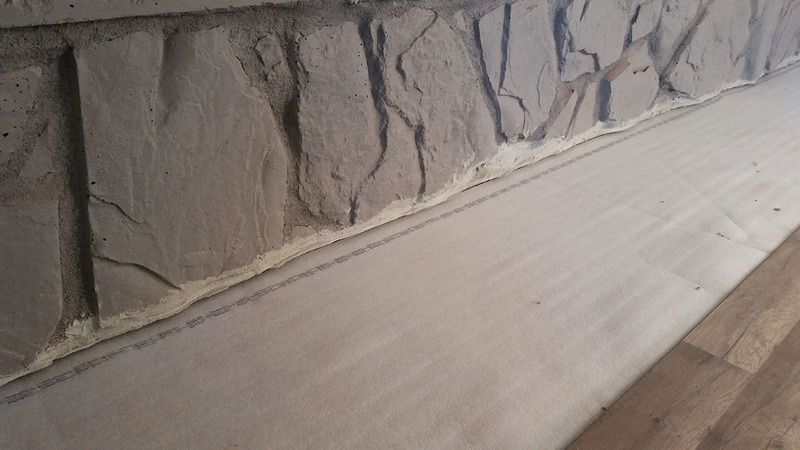 Horizontal cracks in the walls and water seepage. I was informed that all we needed were 15 steel I-beams installed for reinforcement. I knew the other basement water issues would be fairly easy to solve. I was not concerned about the mold as I have dealt with this before. 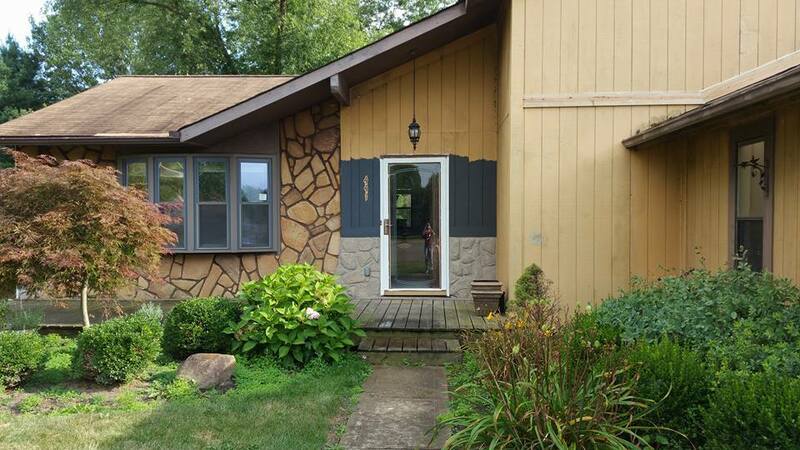 The outside of the home was hideous. Some of the wood siding and trim needed replaced. The roof had three layers of old shingles. Plus typical cosmetic stuff. The inside was worse. Nearly everything had that old 80s/90s dark and dreary look to it. It smelled horrible. 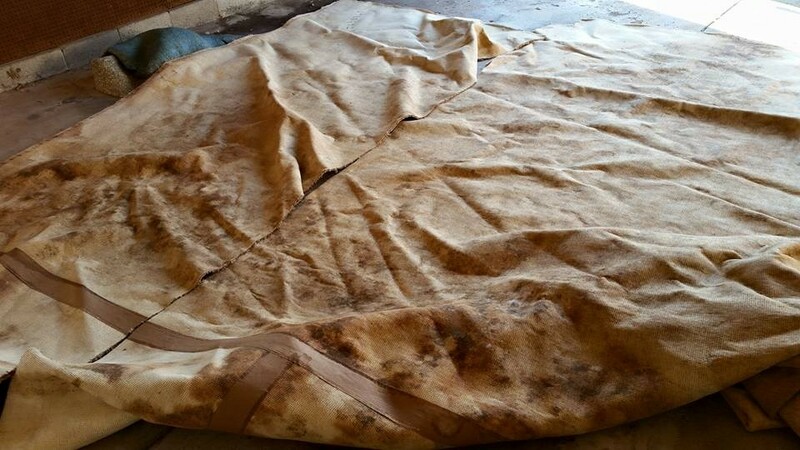 Animal urine soaked carpet in many rooms and mold in some areas of the lower levels. Broken and non-functioning various small things. Bad seals on some of the windows. Condition of the plumbing was unknown. Breaker box needed to be updated. Some electrical needed to be replaced in the basement. HVAC appeared to work. Water heater looked newer, but didn't know if it worked. For the price, there was nothing scaring me away. 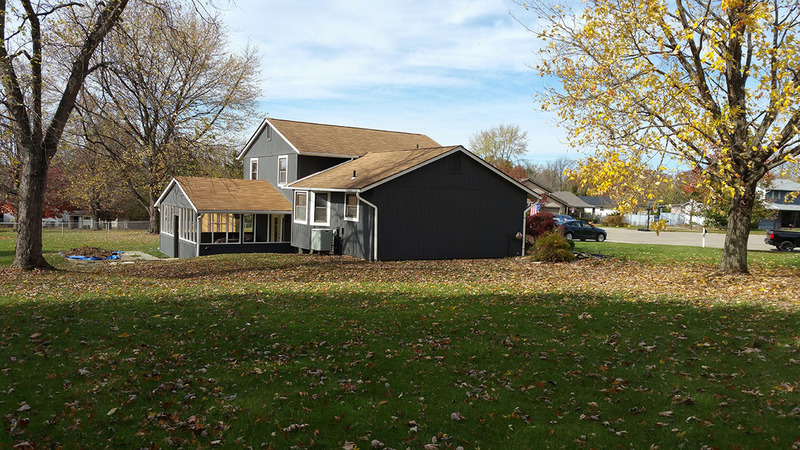 I got my property specific pre-approval for a 203k renovation loan and started bidding on the property. I only had one other bidder who I later found out was actually a neighbor! Haha! But I quickly outbid him. 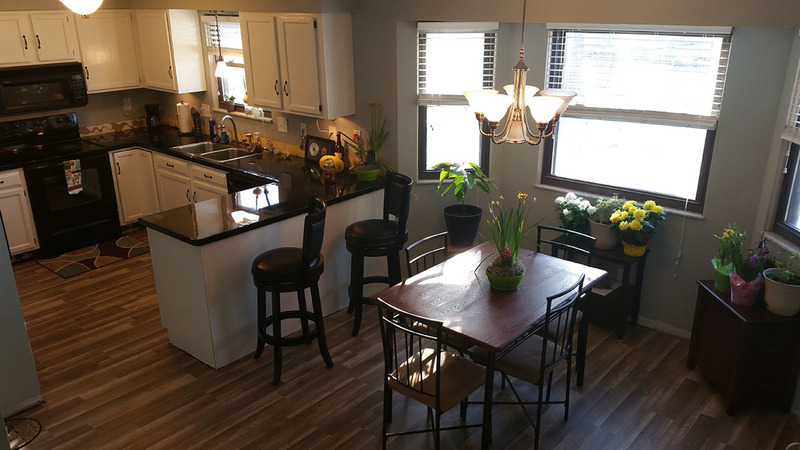 I was the high bidder for quite a while and could have stopped bidding below the reserve, but I did not want to lose the property and continued bidding until I hit the reserve. After two years of fighting fierce competition on other properties I lost, I wasn't about to lose this one. I won the bid at $93k. Having looked at comps and the analysis from my mortgage lender and realtor, I KNEW this house was worth more. Trying to get through all the hurdles to closing was a complete nightmare. Neither of my two 203k projects went smoothly in the beginnings. There was always some mistake that the bank, title company, or realtor made that held things up. I believe I won the auction in April 2015 and did not close until July 2015. 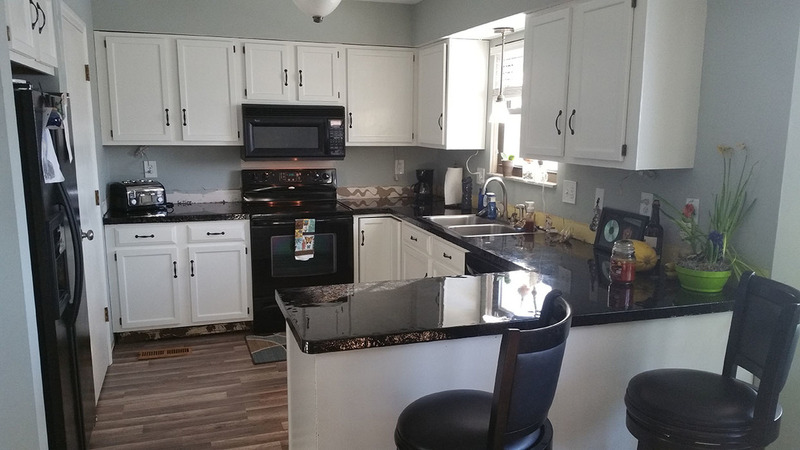 We went through multiple extensions and I thought for sure the seller would back out. I had issues with the bank getting cold feet and demanding every document about myself that I could possibly come up with, plus my unborn child. My biggest irritation was with the appraisal process. We were way behind schedule because of the bank. Then the appraiser was taking her sweet time. She had our file for weeks and had not done anything. I am a go-getter. I get things done. I don't like people slacking on the job. So I called my realtor and asked for the appraiser's contact information. He gave it to me and I called her. I got no answer so I left a message. Next thing I know, I get a phone call from my mortgage guy yelling at me because I called the appraiser. Come to find out, it is a major violation for me to be in contact with the appraiser! And because I called her, she reported me to FHA or whoever oversees that! What a B that appraiser was! I had no idea I could not contact the appraiser. My realtor dropped the ball by giving me her phone number. And my mortgage guy never warned me either. Because of all that, my whole deal came to a screeching halt. Dead in the water. It was going to take an unknown amount of time for my deal to go through multiple reviews from various departments from various entities. All to make sure I did not unduly influence the appraisal. What a joke! I never even talked to the lady! I only left her a voicemail asking her to call me back! I thought for sure the seller would walk at that point. After more delays and debating the issue, Wells Fargo finally decided to order a new appraisal from someone else. The new appraisal came in exactly as I had expected it to. No problems there and it was fast! I had my inspection done which resulted in more annoyances. I asked my realtor if I needed to get the water turned on. He told me not to because it usually isn't allowed in foreclosures because it could cause damage. So I had the inspection done with the water off. 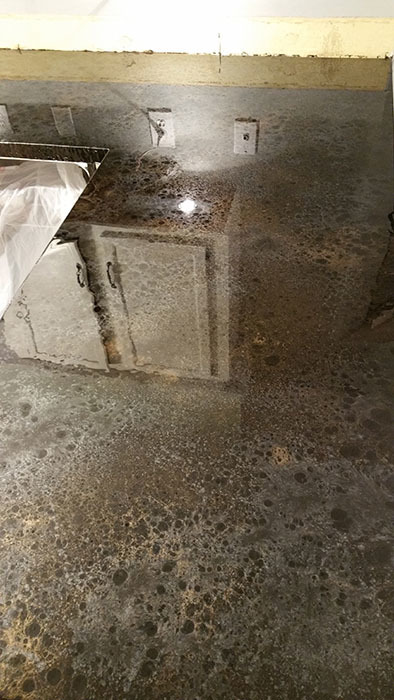 The bank came back questioning why the water was not on at inspection and demanded that we redo the inspection. More delays and more money. I was mad at my realtor! Inspection turned up some unexpected things. The insulation in the attic was inadequate. The bathroom vents were not connected to anything. The ventilation in the attic was not adequate. 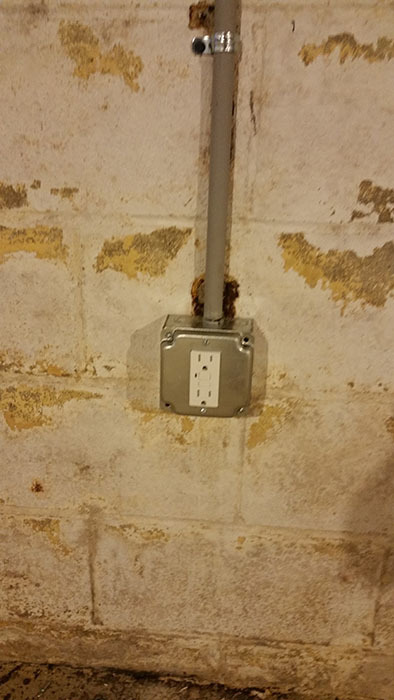 We needed GFCI outlets. A toilet was loose. 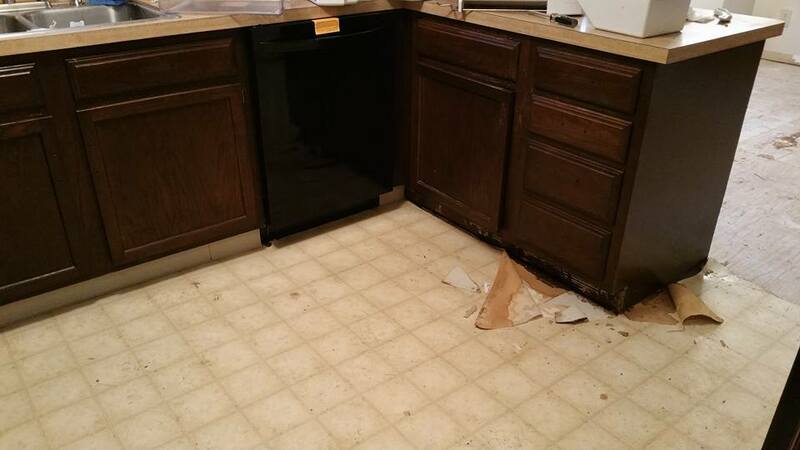 There were unknown plumbing leaks as the system would not hold pressure, but we could not find any actual leaks. 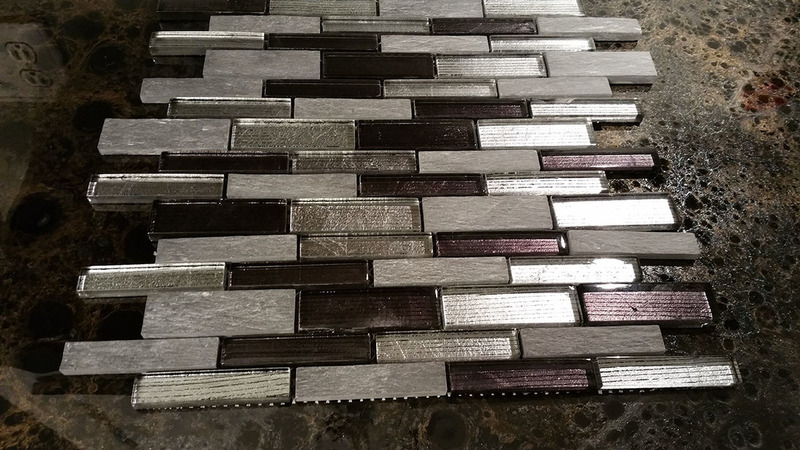 Then I had estimates from various contractors and chose the one I thought would be best. I really liked the guy. He seemed professional and was a referral from my mortgage guy. I ended up having issues with him, but will touch on that later. I kept checking on the property during all of this mess to make sure no one had stolen anything or vandalized anything. Near the end, I discovered that the power was cut off by the seller so the sump pump stopped working. It was about to storm pretty bad so I had to scramble to get permission to turn it back on in my name. I hadn't even closed on it yet, but the seller would not turn it back on themselves. 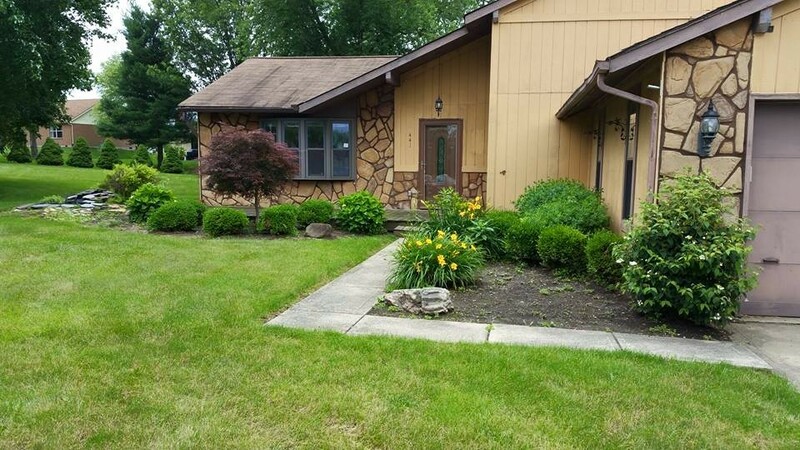 I finally was able to close on the property July 2015. I was so relieved to finally be past all that nonsense! @Jessica Hood this is great information cant wait to see the outcome of all this. Much success to you with this deal. 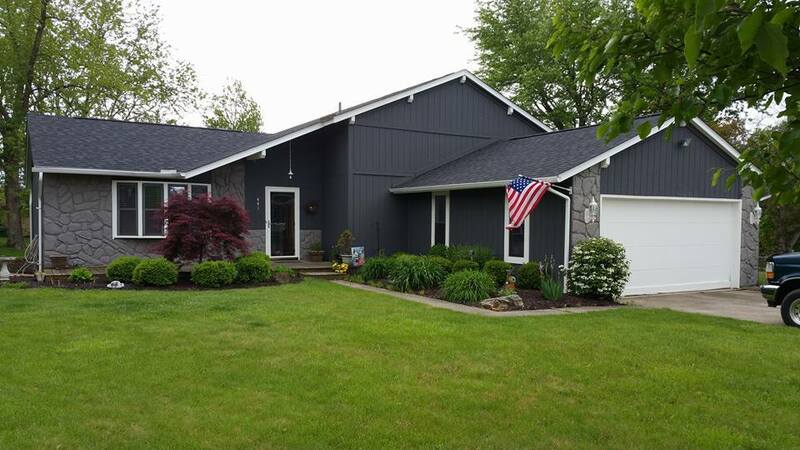 @Jessica Hood I know about this house and I'm very interested in hearing about how it works(ed) out for you. If there's anything I can help with let me know. Inquiring minds want to know! I look forward to hearing more. @Matt Stewart You do? Awesome! After I bought it, I heard a lot of people had been keeping an eye on it. I am honestly surprised that there were not more bidders for the online auction. You are in Pickerington as well? I didn't catch that when you messaged me earlier. It is good to know other locals that are experienced. @Jessica Hood , yes I've been in Pickerington for about 20 years and flipping for the past 8 years. 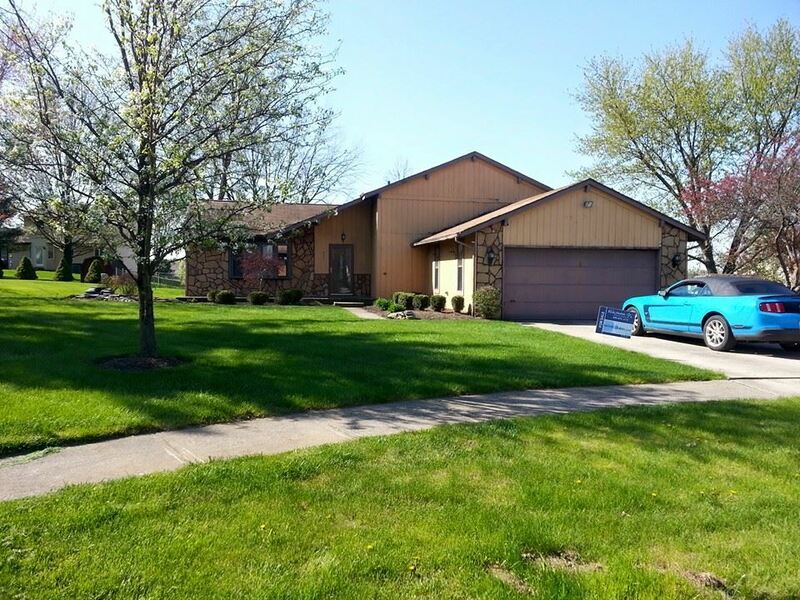 I do remember the house because you don't see houses in Pickerington at the price point very often. I didn't go see it because I was fully invested at the time and I knew it'd get a lot of attention. Had I had the cash on hand I definitely would have been bidding against you. Interesting reading about the issues you had with the appraiser, although I'm not surprised. Appraisers hold a lot of power in a real estate transaction and some of them have let that go to their head. As a seller there are a few appraisers that I will absolutely not allow to appraise my property. Of course as a buyer it seems the rules are a bit different. @Matt Stewart I do believe I got really lucky with this house. It was a great deal. I am really happy with it. 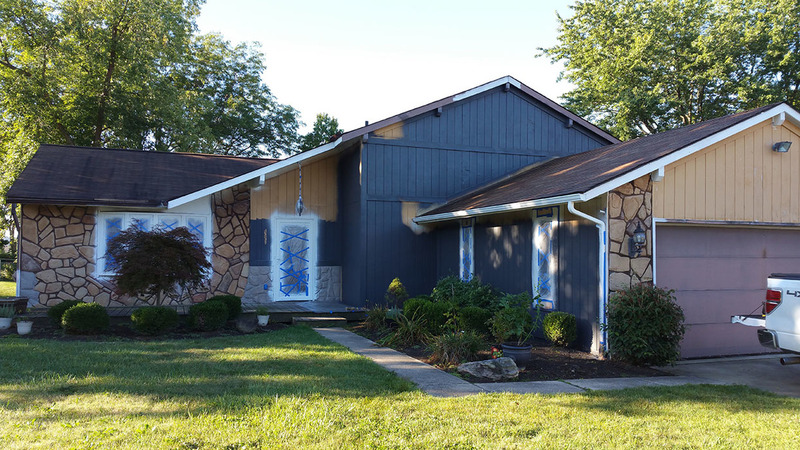 The appraiser issue was definitely a lesson learned the hard way! @Darnell Griggs Yes, it is already worth it. I could sell it as is now and walk away with a good profit. I am not even 100% done with everything yet. I have more pictures and info coming up soon! 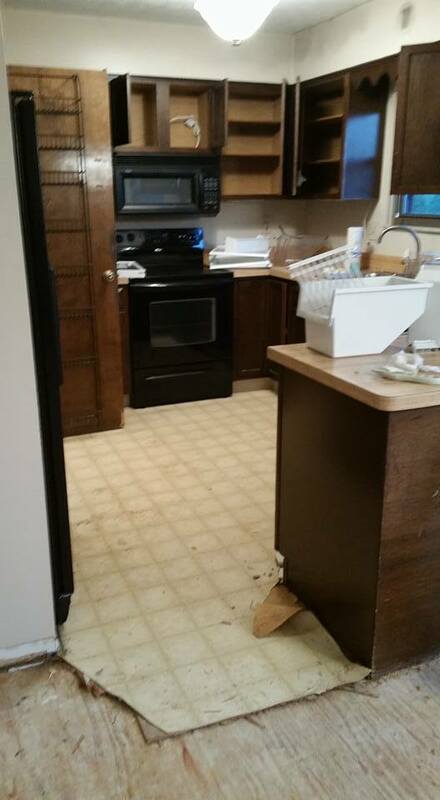 Once we closed on the property in July 2015, we began our clean out by tearing out all of the old carpet ourselves. It was soaked with animal urine and smelled horrible! 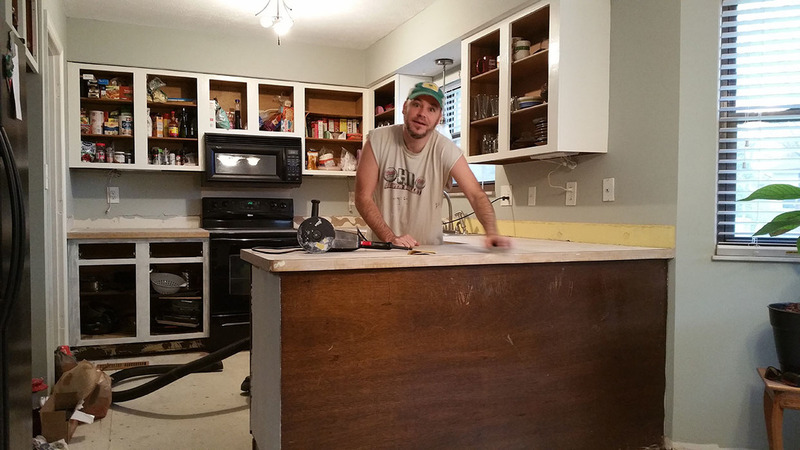 Next was tearing out the old linoleum in the dining area and kitchen. 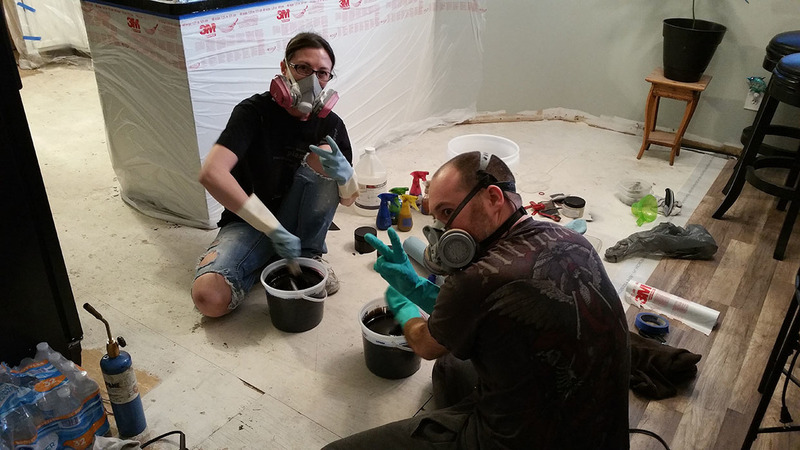 We also went in with full protective suits, masks, and eye protection to clean up the mold in the basement. 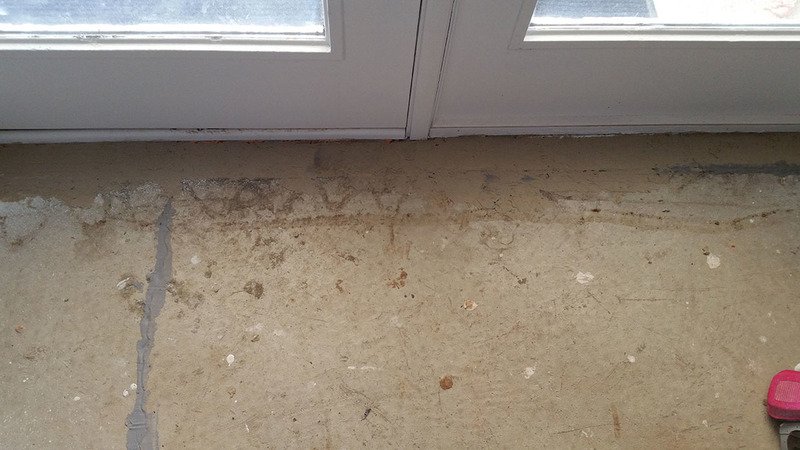 There had been water intrusion through the walls which resulted in a variety of molds. 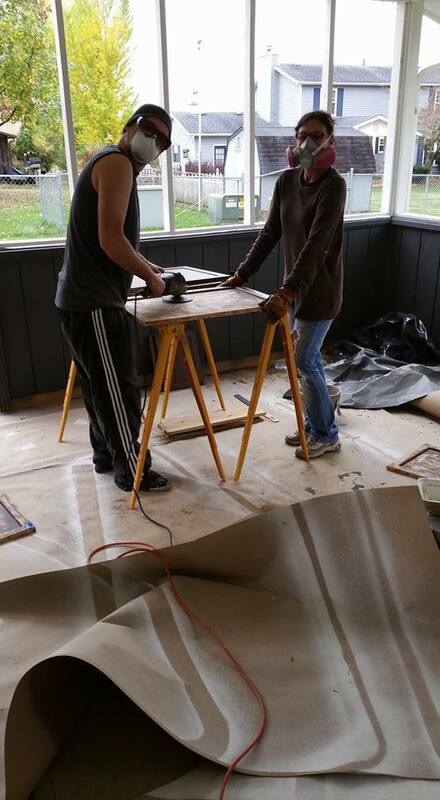 We first scrubbed the effected concrete block walls with abrasive tools and mold killer to remove lose debris. We washed every surface down with mold killer. 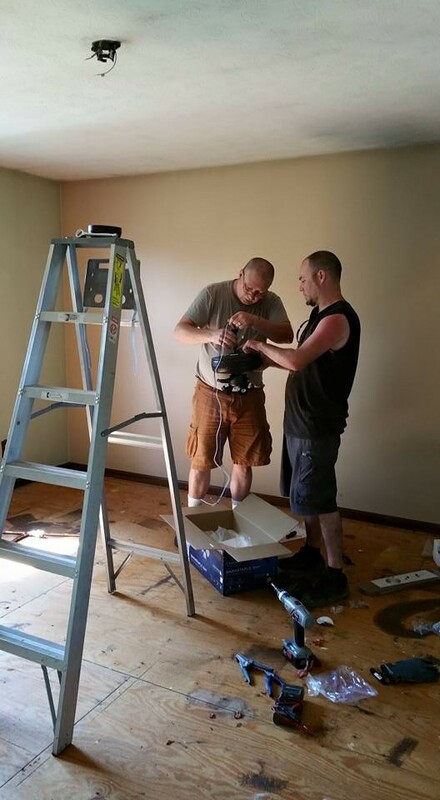 After all debris were removed from the house, we closed it up and used a fog machine to fog every room, all vents, and the attic spaces with Concrobium mold treatment. 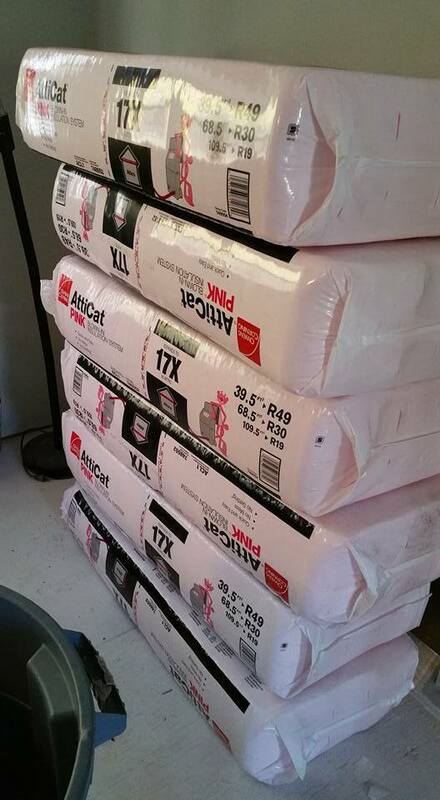 No $10,000 mold abatement required! 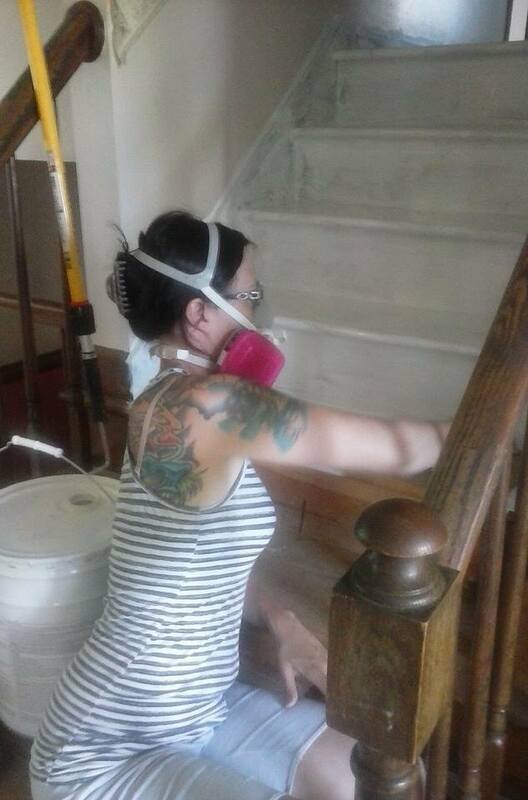 Here we are, almost a year later, and the house is mold free! 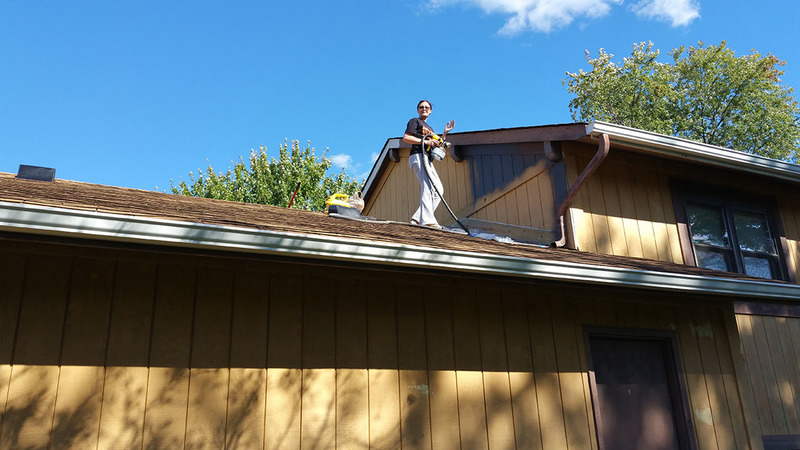 We also had to clean the gutters which eliminated a good portion of the water intrusion. 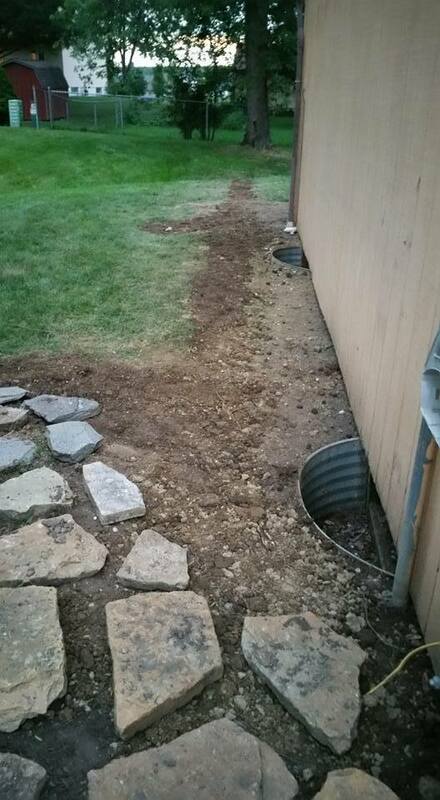 Then we installed a top level french drain below the frost line. Because we sit on a hill, water was passing over the existing swale and coming into the basement. We installed this ourselves in a couple of days with a layer of weed barrier cloth, rock, corrugated pipe, and end caps. We extended it straight out into the swale at the lower slope. 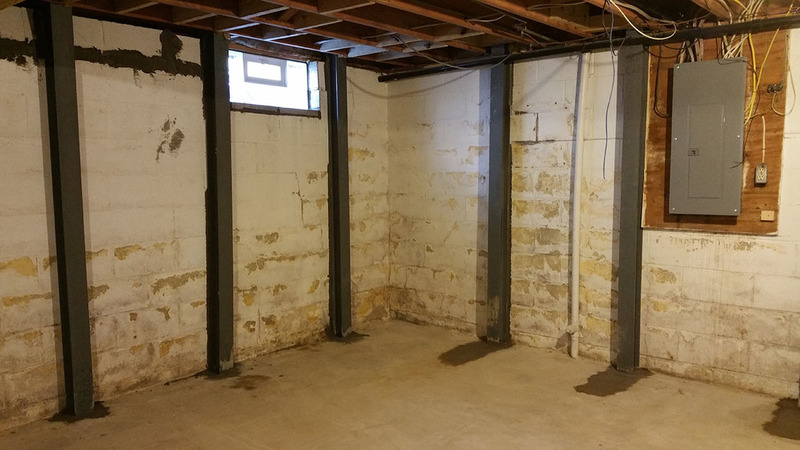 We then had to have a contractor install 15 steel I-beams into the basement to support the foundation walls. They had a bit of inward movement from hydro-static pressure. The structural engineer I had look at it before closing said we were still within an acceptable level of moment and did not need to dig out the foundation. 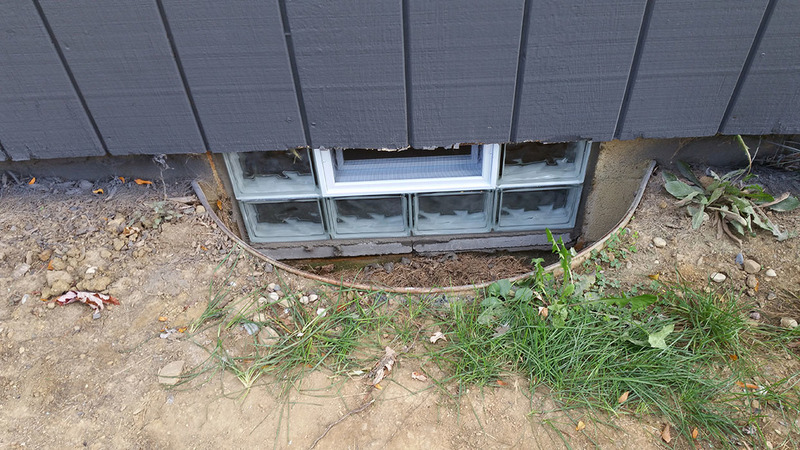 We also replaced the basement windows with new block windows. We had to have the city replace the water meter, after we cut out the old water softener system. We did the cut out ourselves. The water softener pump was bad. 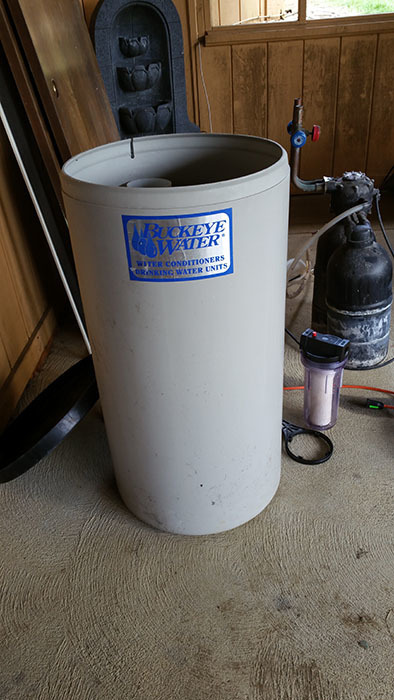 The water company said the water softener was unnecessary, as they have a new water treatment system. 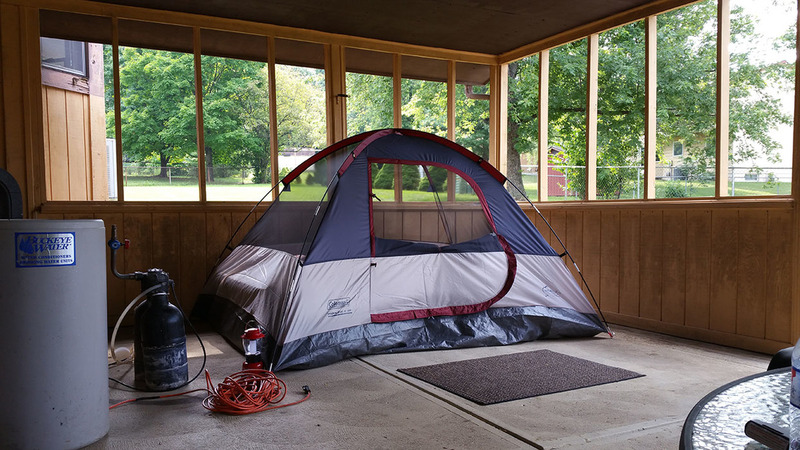 We got tired of traveling back and forth to the property to work on it, so we pitched a tent on the porch! We are no stranger to "roughing it"! I had a visit in the middle of the night from the neighborhood raccoon. Scared me half to death! 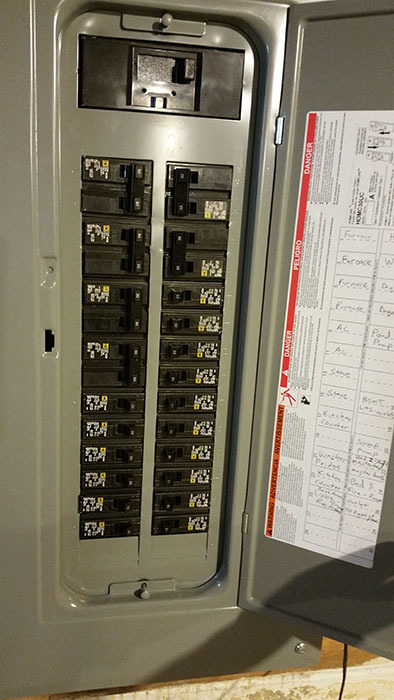 We had an electrician install a new electrical panel and new GFCI outlets. He also removed and exterior hot tub outlet that was not up to code. 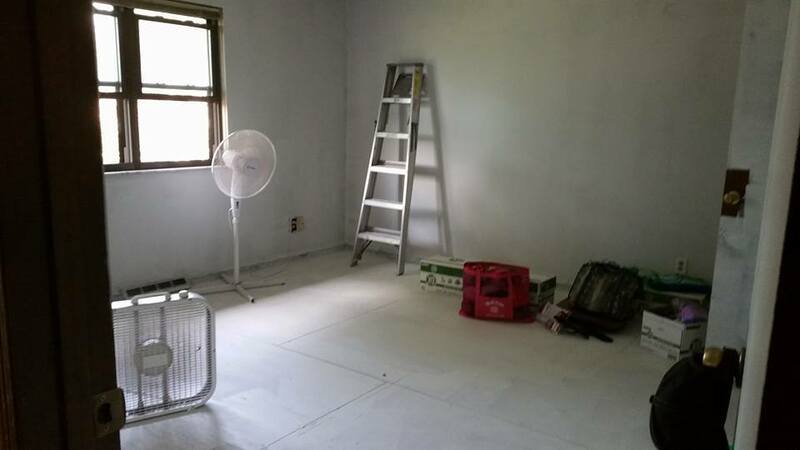 We began painting all of the walls in Kilz Latex and the floors in Kilz Original to eliminate animal and smoke odor. 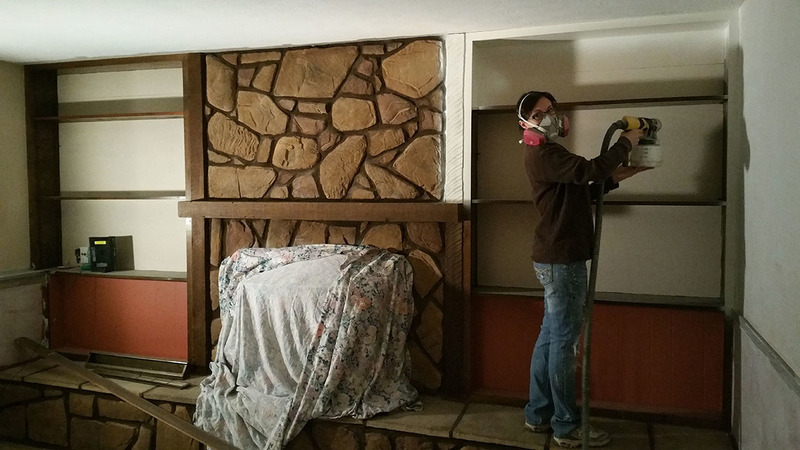 Smoke odor and stain was from long term use of the fireplace. The house smells clean and new now! Kilz is wonderful!! The bank has requirements that contractors do ALL of the work. I have my ways and was able to work it out so we did parts and contractors did parts... just enough to keep the bank happy. 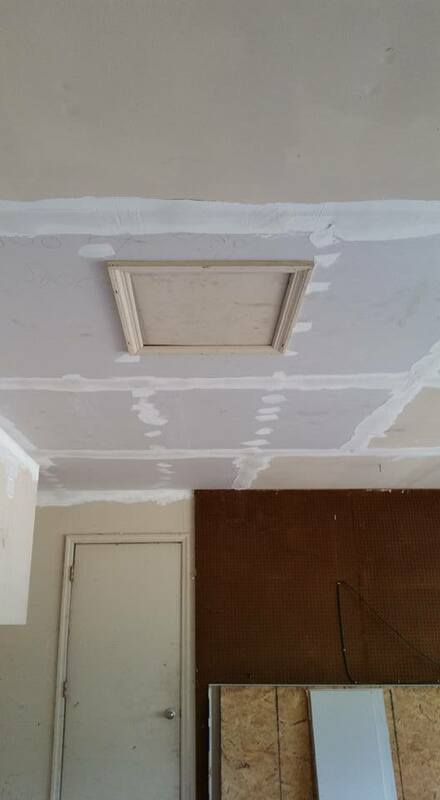 Contractor replaced water damaged drywall in the garage. 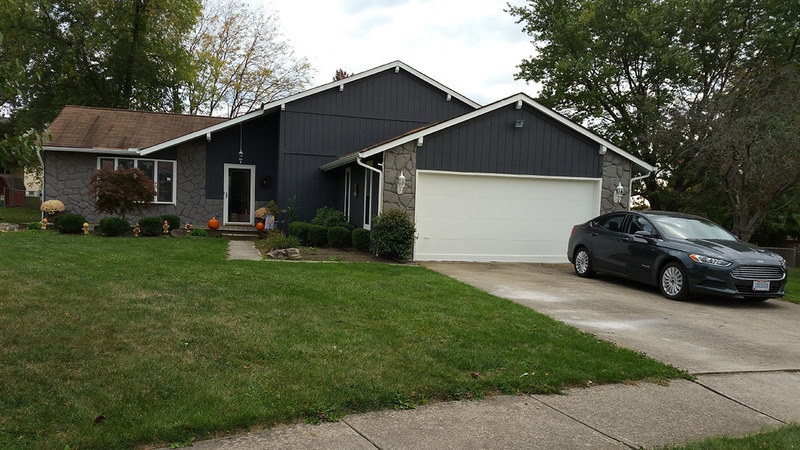 Contractor replaced bad wood siding and trim on the exterior. Contractor also reattached the bathroom exhaust vents and installed new hat vents. 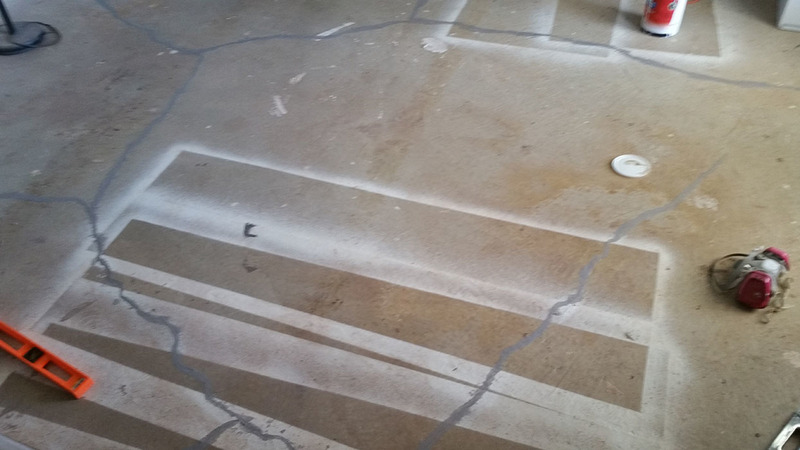 We found a lovely surprise hidden under the carpet and behind the drywall... water damage. 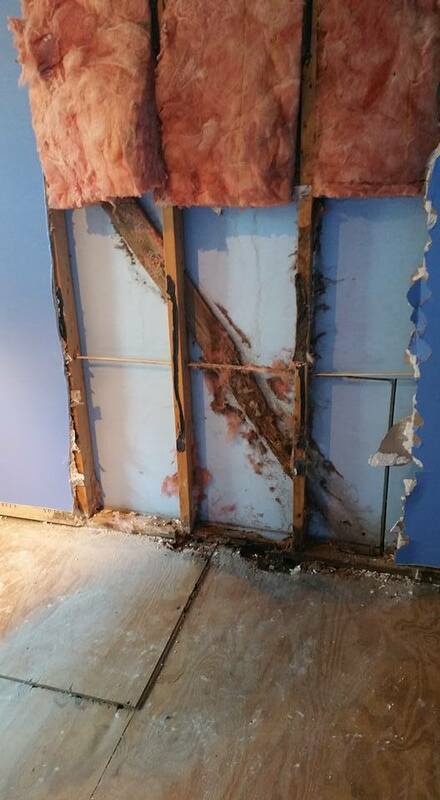 Contractor replaced the bad subfloor and sistered the rotted beams in the wall. Many light fixtures were missing and we installed new ones ourselves. The water heater shorted out and blackened the inside foam pad. I called the manufacturer and discovered it had THREE days of warranty left on it! I just barely managed to get it replaced for free under warranty! Went right over to Lowes and got a brand new $500 water heater! Talk about luck! I had to have a garage door company install a new garage door opener and do some maintenance to the tracks. The door itself was pretty solid, so we opted to paint it. I climbed up in the attic and blew in new insulation myself. What was there was insufficient. It was my first time doing that. It was pretty interesting and surprisingly easy. Cheap too! Kitchen before we did any work to it. 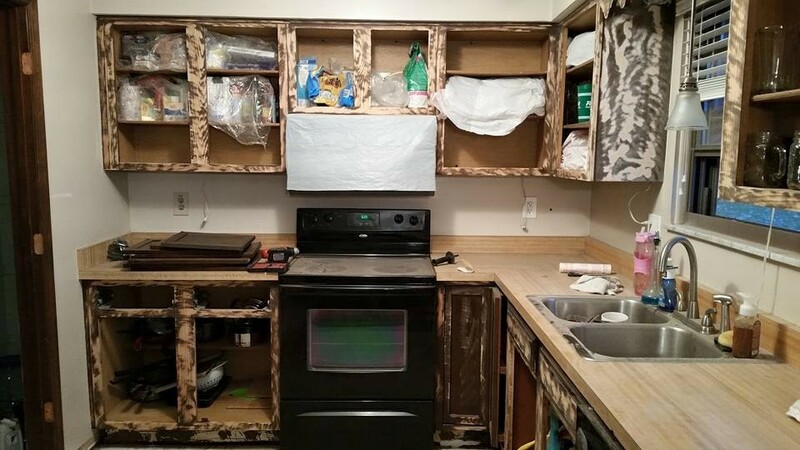 Painting cabinets with Kilz and cabinet enamel. 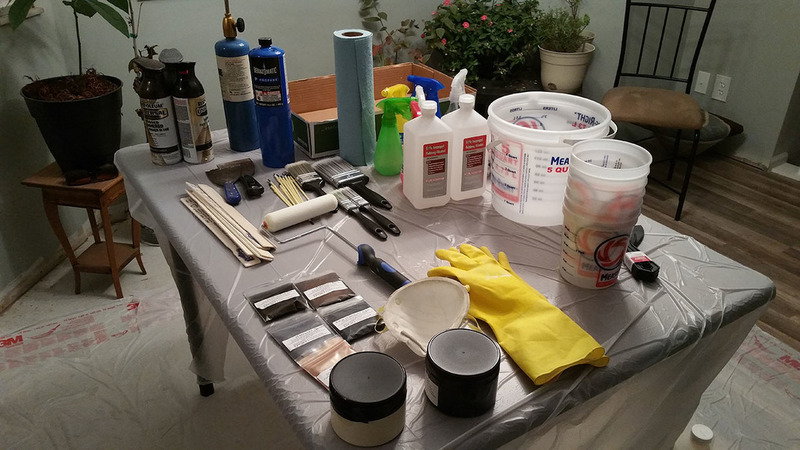 I wrote another post about this whole experience in the DIY forums. 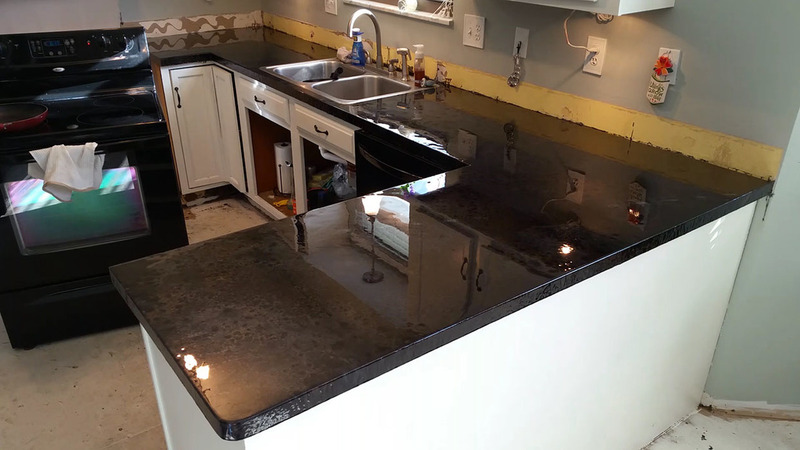 We opted to resurface the counters with Countertop Epoxy Resin. 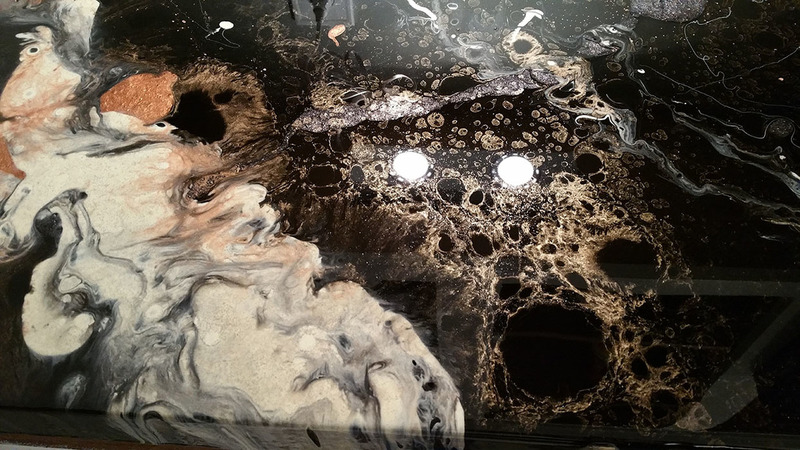 First we had to sand the counters and then apply the resin. 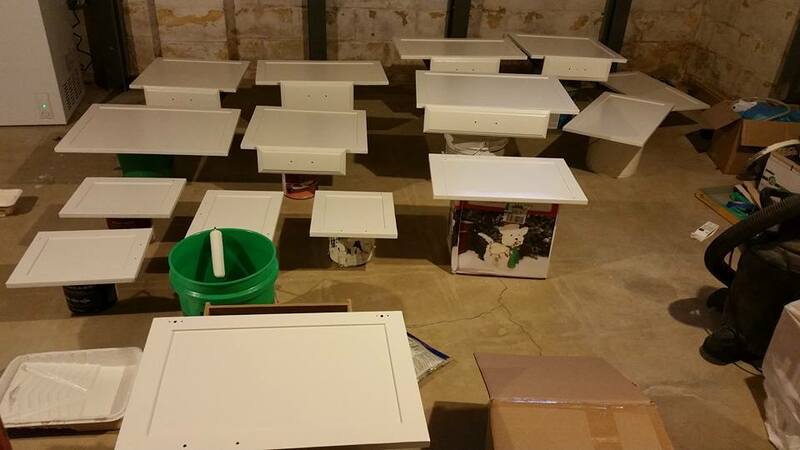 I wrote another post about this whole experience in the DIY forums. 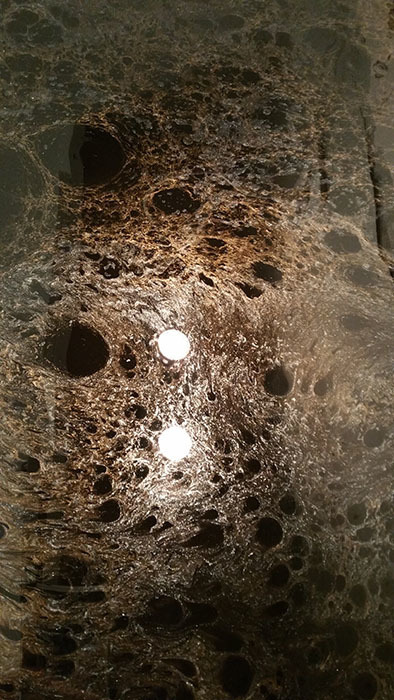 Our first attempt did not go as planned, but still looked interesting. Second attempt/application was more what we wanted and it turned out beautiful! 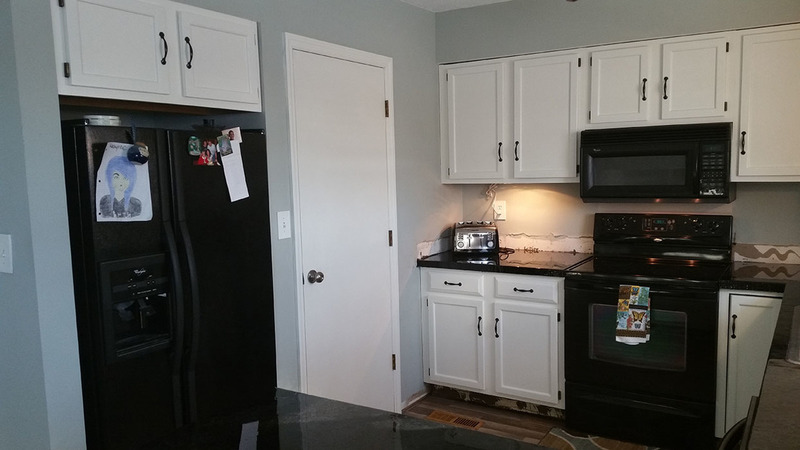 Refinished cabinets and counter! New paint on the walls. New cabinet hardware. 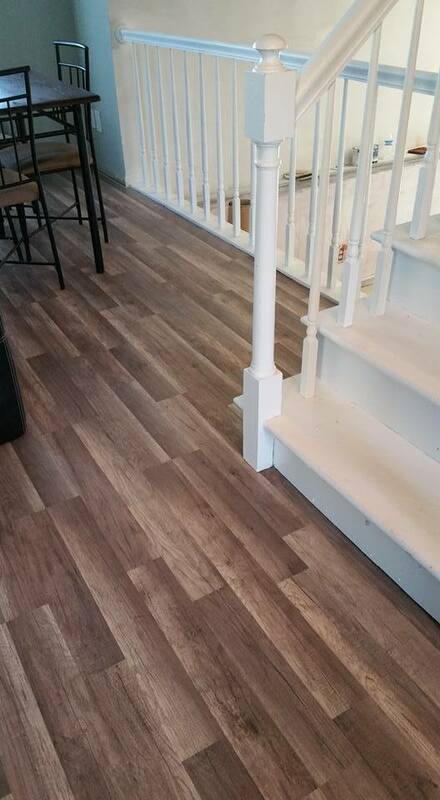 New laminate flooring. Amazing! 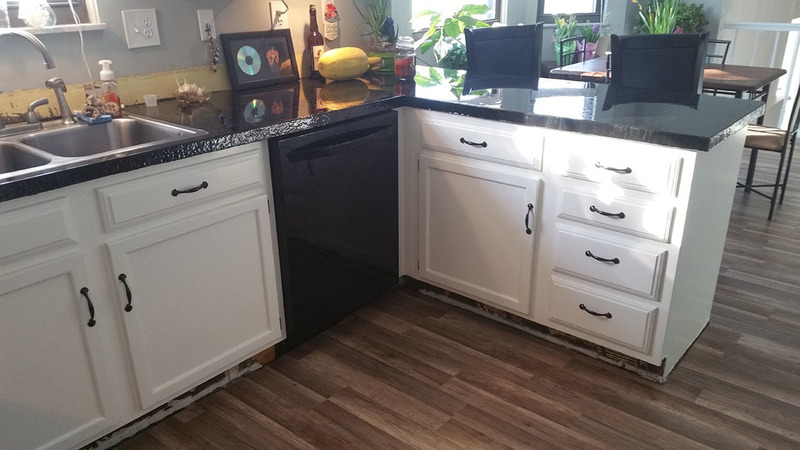 We still need to install the backsplash, cabinet trim, and baseboards. Very good info! Keep it coming. Can't wait to see what the final numbers are! 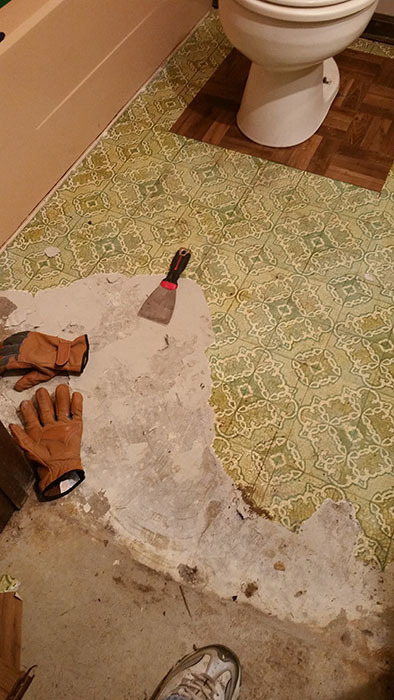 Had to undercut in several places so the floor would slide under. 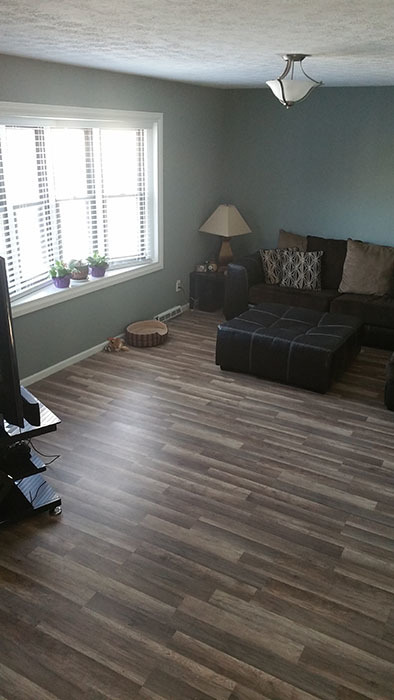 Got the formal living room painted and laminate flooring in. 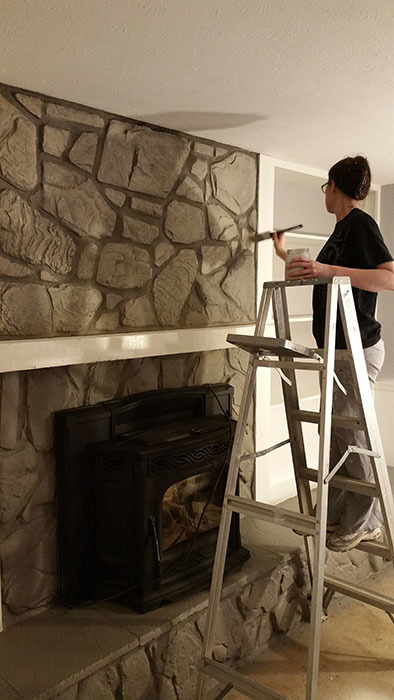 Continued painting the lower level family room. 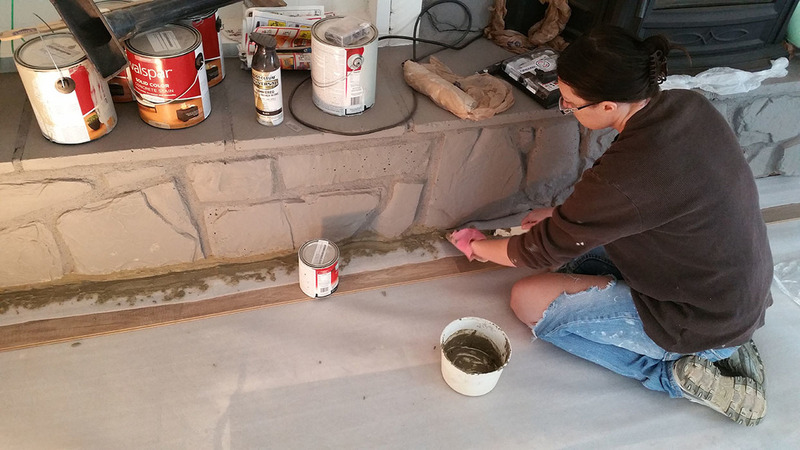 I used Valspar concrete/stone stain and color for the fireplace. I used the paint sprayer for the base coat and then hand painted two highlight colors on the face of each stone. I do not have a finished photo of this yet. 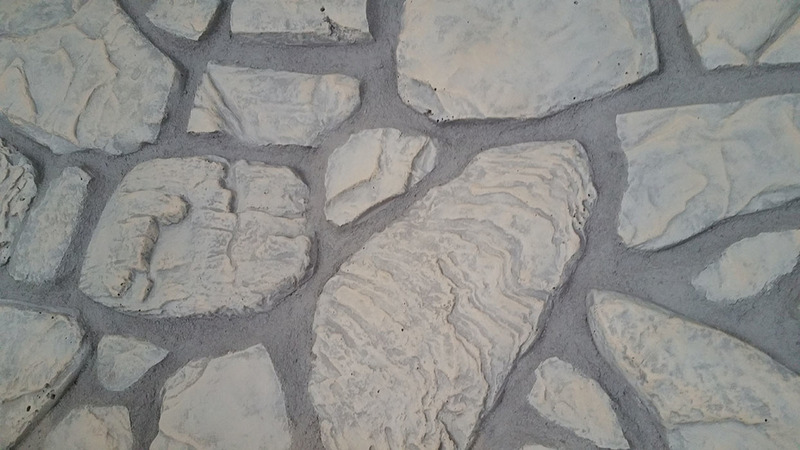 The stone wall inside will match the stone walls outside. 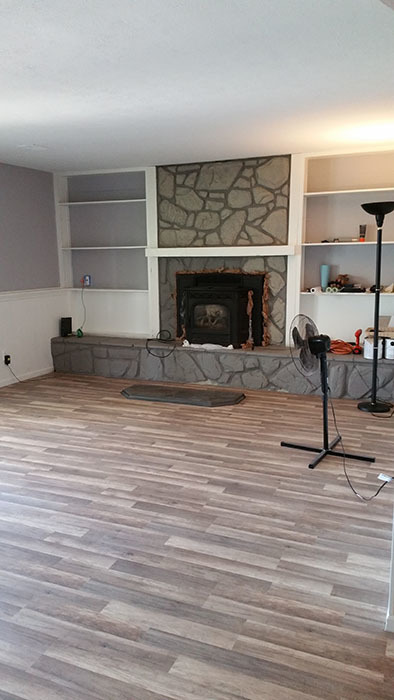 The floor in the lower family room was uneven and cracked from previous shifting. I had to use crack filler and floor leveler. 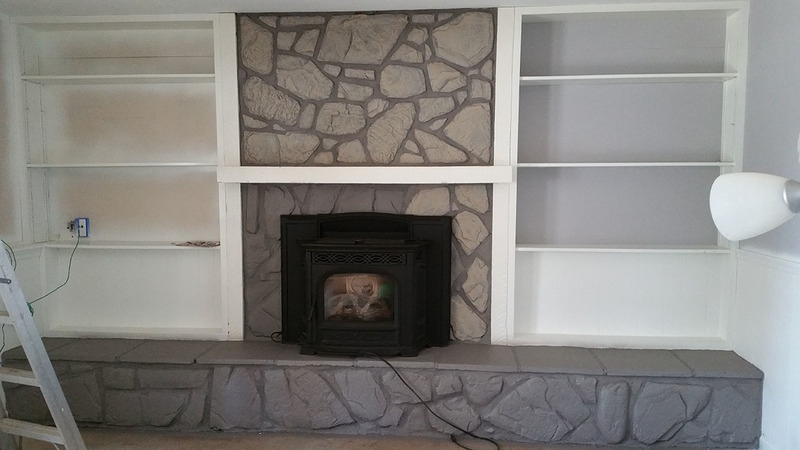 I had to undercut the stone fireplace face for the flooring to fit under. I wrote a detailed explanation of this process in the DIY forums. 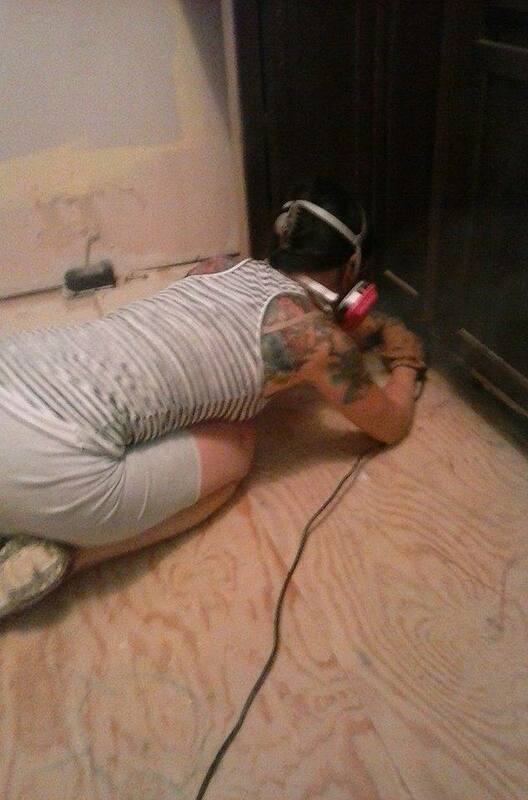 Here I am applying new mortar after the undercut. Dried mortar and new space for floor underneath. 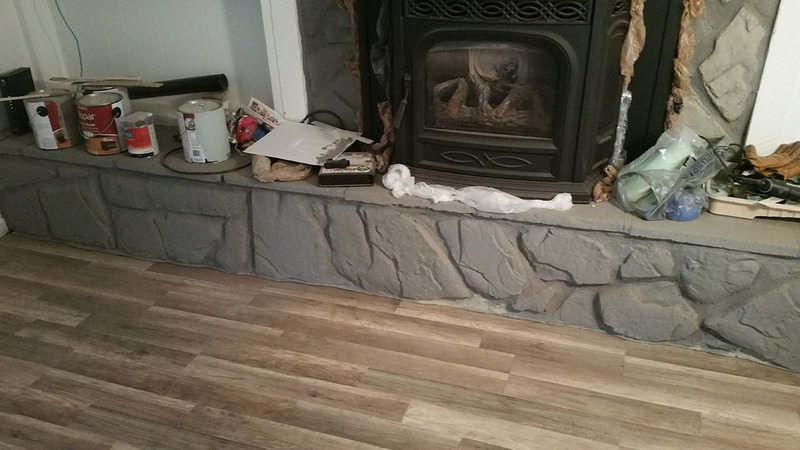 Still need to finish painting the stone here, but the flooring is in. I drove around and found a house in a new neighborhood that I really liked. I wanted modern colors. I picked this one as my model. 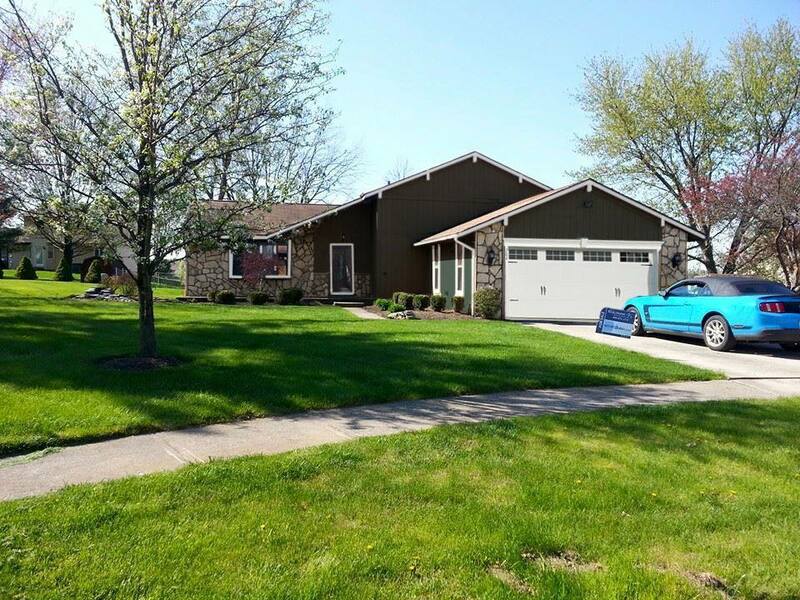 I am a graphic designer and web developer, so I used Photoshop to try out some different color possibilities for our house. Here I am testing color samples. This gives you an idea of the vision that I had/have for this house. Of course, I went with the dark grey. 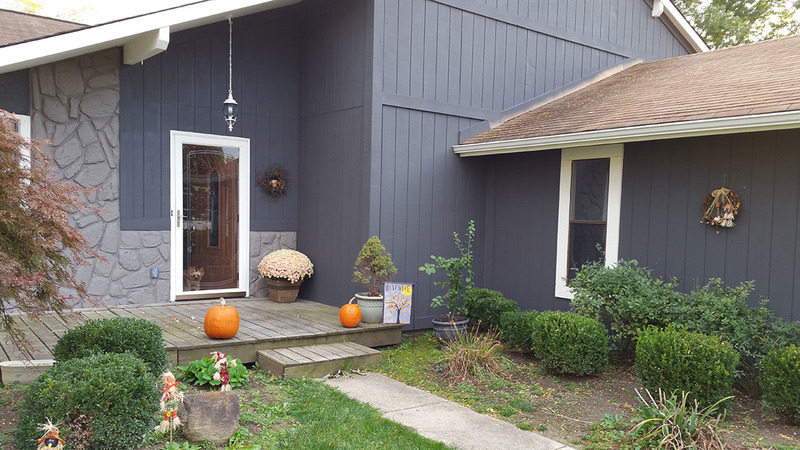 We painted the whole house ourselves. 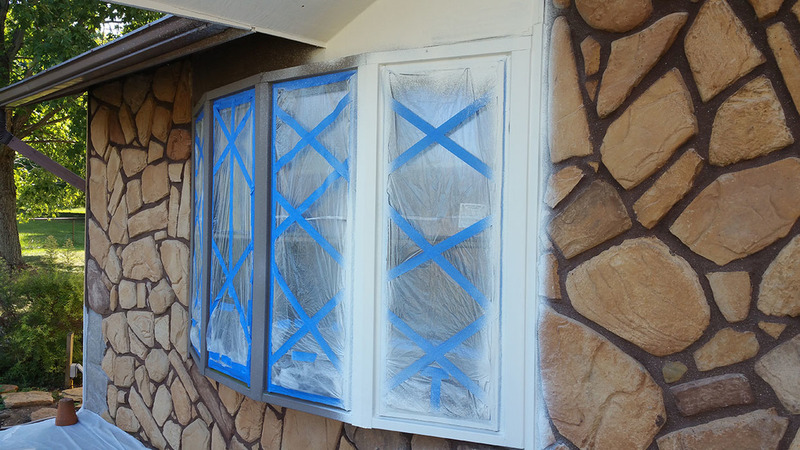 We also had to have contractor fix two windows with bad seals. Here is a little side story for you! I got a letter from Nationwide insurance just before the contractors started their work. They said they were dropping my insurance because the house was in such poor condition. 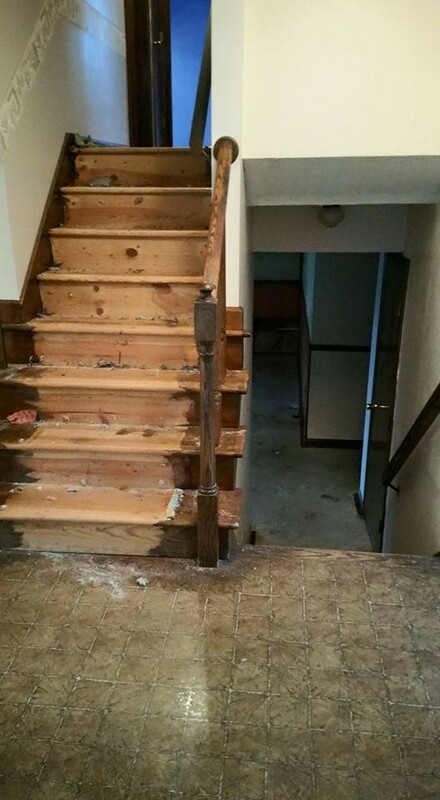 I had to fight with them not to cancel my insurance based on the fact that I bought the home with a renovation loan and that the issues were going to be fixed. 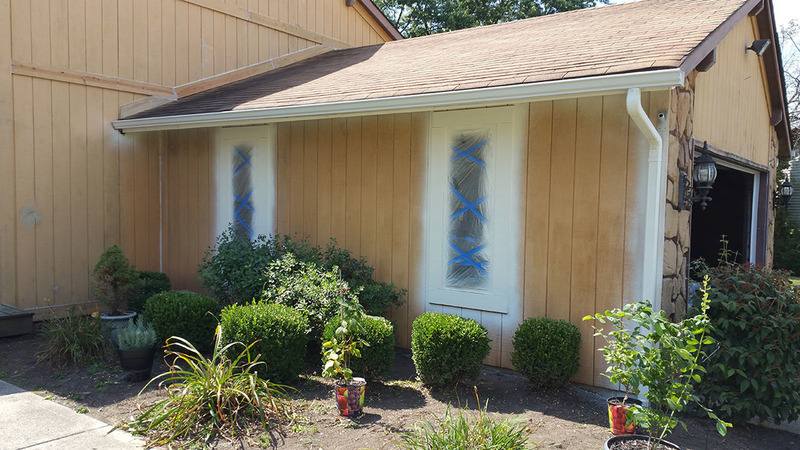 During the winter, we had a problem with ice damming at the front of the house. Water started pouring into the bay window in the living room. 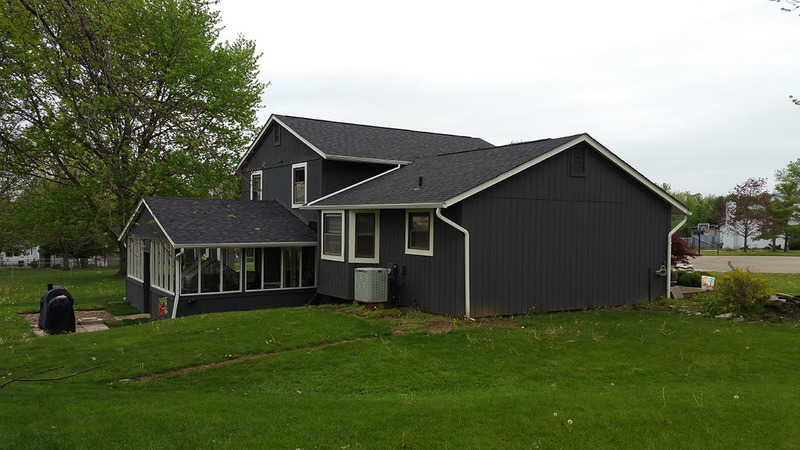 Then in the spring, we had two wind storms come through and damage the shingles on the roof. 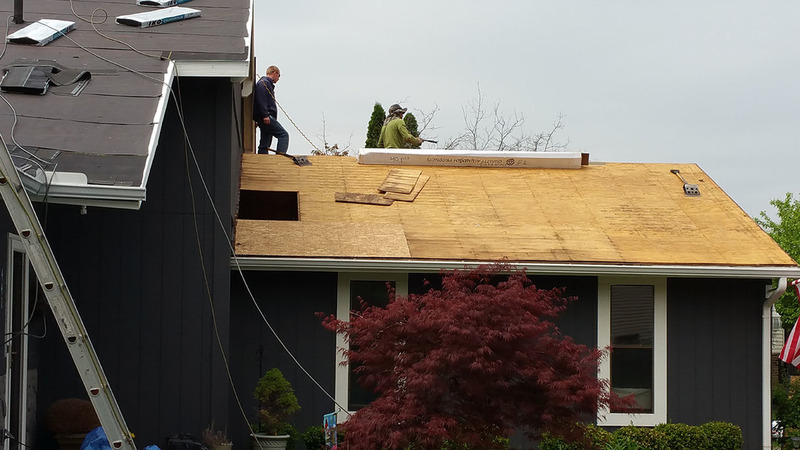 The roof was old and had three layers of shingles. We also had a roof leak on the back patio. 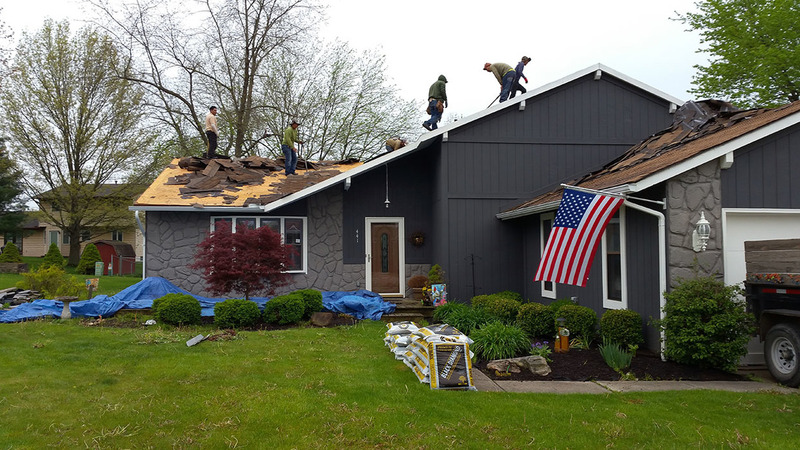 Integrity Construction came in and got Nationwide to replace the whole roof! Now the house looks amazing! 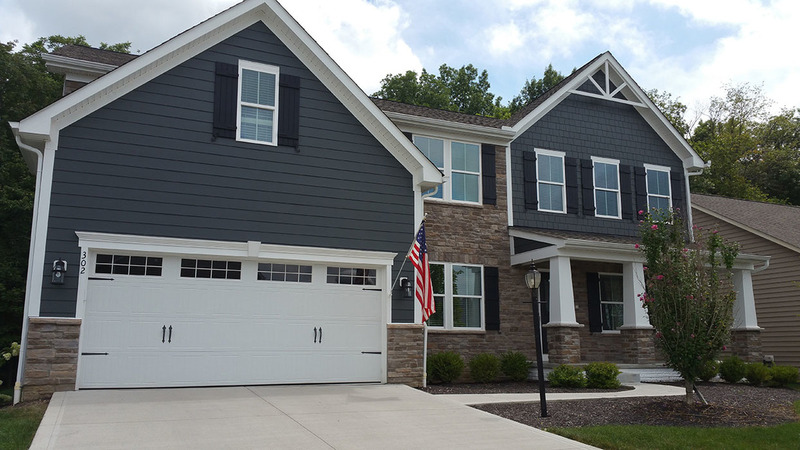 I still have to hand paint all of the stone on the front, the front door, replace the front porch light, and apply accents to the garage door. But the outside is almost done! 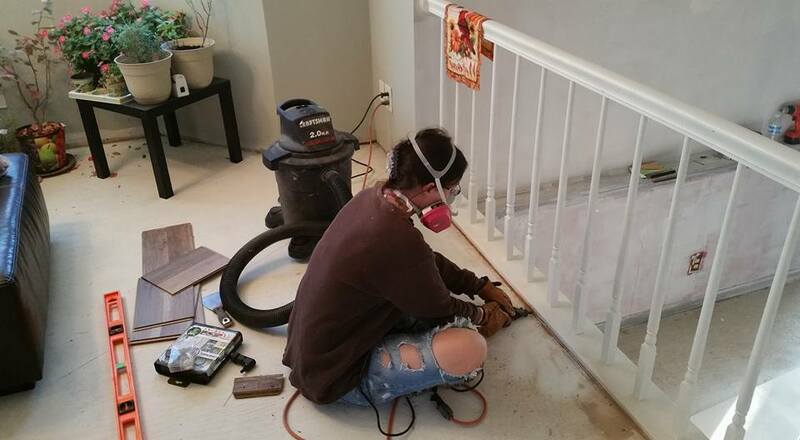 I want to also share my experience with my general contractor. He seems like a good guy, but I suspect there was something going on in his life that started to pull him away from his work near the end. There were several things that he was supposed to still do for me, but he just disappeared. He gradually started taking longer and longer to respond, then nothing at all. 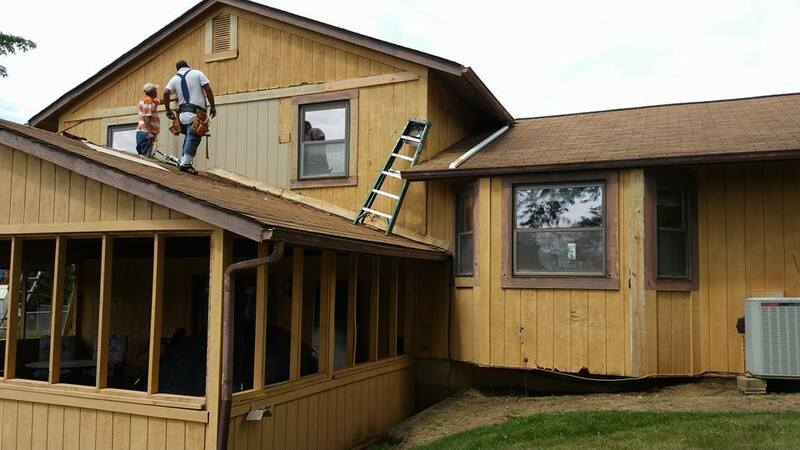 He was supposed to replace some windows, fix some remaining siding issues, and sand the drywall he replaced in the garage. He just disappeared on me. He did not get paid for it, of course. I haven't heard from him since before December. I later found out that his guys had installed the hat vents over the garage backwards. I did not catch that until the roofing company pointed it out. 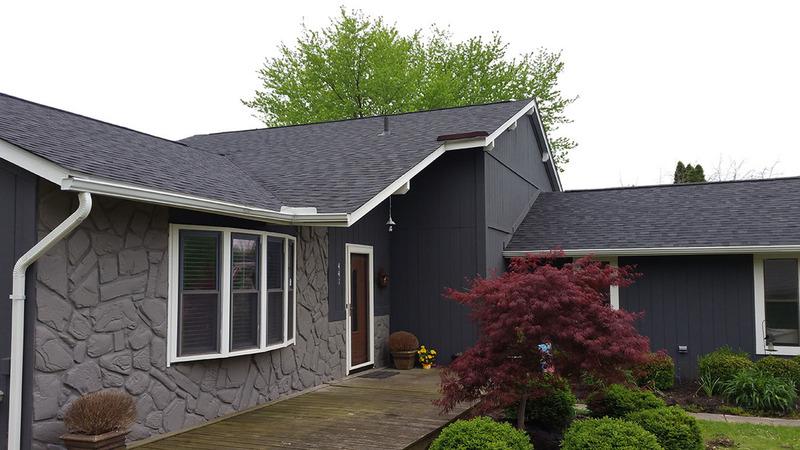 The roofing company did a great job, with only minor issues. I had brand new gutters installed before the roof and they dented one. They are going to replace or fix it. 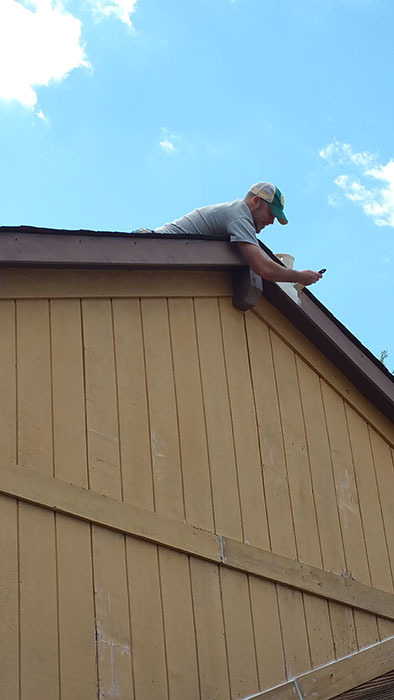 They did not install some of the trim as it was before, but they are fixing that as well. Other than that, things look good. This is a great post. Definitely learned a lot about the process!! Stories like this are so exciting! Great job, you guys put in a ton of work. I love before/afters. Can you go into more detail about how you got started? Did you get pre-approval and then bid?